The treatment of multi-vessel coronary artery disease ranges from intensive medical therapy to percutaneous coronary interventions to conventional open-heart surgery. Prospective randomized studies over the past 30 years have demonstrated that surgical revascularization remains the best long-term option in patients with multi-vessel disease. The long-term survival advantage of coronary artery bypass grafting (CABG), however, originates predominantly in the patency of a left internal thoracic artery (LITA) graft sewn to the left anterior descending artery (LAD). As the patient population referred for CABG has grown older with more co-morbidities, avoidance of cardiopulmonary bypass and the application of less invasive revascularization strategies has become more appealing. At the Montefiore Einstein Center for Heart and Vascular Care, minimally invasive cardiac surgeons and interventional cardiologists routinely perform hybrid revascularization in patients with multi-vessel disease. This approach usually begins with a robotically assisted CABG in which the LITA is sewn to the LAD through a small incision between the ribs. 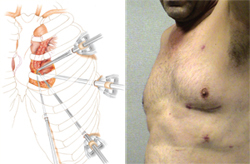 Robotic techniques are used to perform this operation on the beating heart and the breastbone need not be divided. Recovery from this operation has been quite rapid and nearly all patients can return to full activity within two weeks. Joseph DeRose, MD, Director of Minimally Invasive and Robotic Cardiac Surgery and Chief of Adult Cardiac Surgery at the Jack D. Weiler Division, has pioneered robotic CABG since its inception in 2001 and has performed more than 100 operations. The robotic CABG allows high-risk patients to safely acquire the survival advantage of a LITA-LAD, while minimizing the morbidity and complications of sternotomy and conventional bypass surgery. In mid-term analysis (one to five years) angiography has demonstrated equivalent LITA-LAD patency rates between robotic and conventional CABG. While robotic CABG does convey a survival advantage to patients with triple vessel disease, it fails to address coronary lesions in the circumflex and right coronary distribution. With the emergence of drug-eluting stents, percutaneous options have been devised in order to address these non-LAD territories of ischemia. It is postulated that using a strategy of minimally invasive LITA-LAD revascularization, combined with a clinically directed approach of drug eluting stent placement for residual ischemic territories after robotic CABG, the morbidity of conventional CABG can be reduced in higher risk patients while still maintaining the advantages of complete revascularization. Interventional cardiologists, Mark Greenberg, MD and V.S. Srinivas, MD, work closely with the cardiac surgical team to identify patients whose coronary anatomy make them appropriate candidates for this novel approach. By combining the less invasive nature of stent placement with minimally invasive cardiac surgical techniques, the advantages of both approaches are promising. This approach allows patients a quicker recovery and is available to high-risk patients who previously had no other options. In addition, an NIH sponsored multi-center study comparing hybrid revascularization to other coronary revascularization strategies is being developed at the Montefiore Einstein Center for Heart and Vascular Care.